A dish from Western Visayas Region VI. An Ilonggo dish composed of flaked broiled milkfish, tomatoes and onions with spices. I think the more popular term for this recipe is ‘linagpang’ which means to roast or barbecue the meat usually of chicken, fish or pork. Then it is poured with hot water without boiling it. It is , I think a kind of barbecued or roasted meat soup. 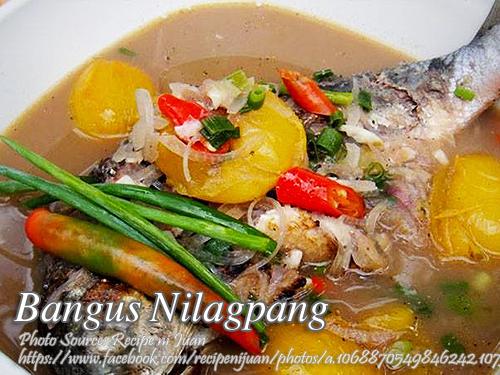 To cook bangus nilagpang: Flake broiled bangus coarsely; remove spiny bones. Slice broiled tomatoes and onion. Mix with bangus. Add boiled water and green onions. Season with salt and siling labuyo serve hot.